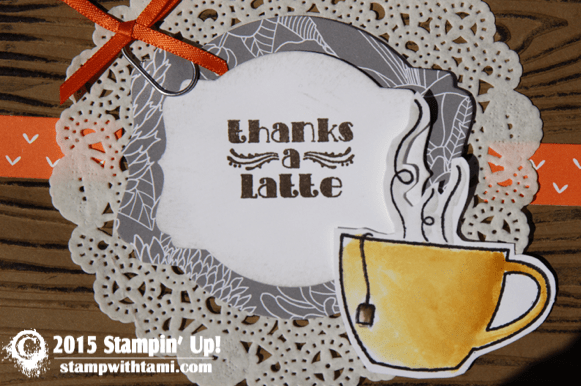 “Thanks a Latte” is the name of the July 2015 Stampin Up Paper Pumpkin kit and exclusive stamp set. It’s flippin’ adorable, and I had fun going “outside the box” with the stamps and accessories for this card. I’ve created a video tutorial for it, in which I will also ask for your help on a random question about freeze pop popsicles. The PP kit July exclusive stamp set includes line art and solid images, also has 2 Classic Stampin’ Spots: Early Espresso and Cucumber Crush. Accent stickers, background paper, paper clip, bow, and striped envelopes. It also comes with instructions to make some super cute cards you can see in the 2nd video I’ve posted below. I’ve included more outside the box projects from this kit at the bottom of this post. As always, we love to share a few other ideas with you, just to show you how much you can do with Paper Pumpkin. Our artist stuck with the same color scheme and pulled in some of the Basic Gray striped paper from the Neutrals Color Collection (item 138435) to create two new cards. 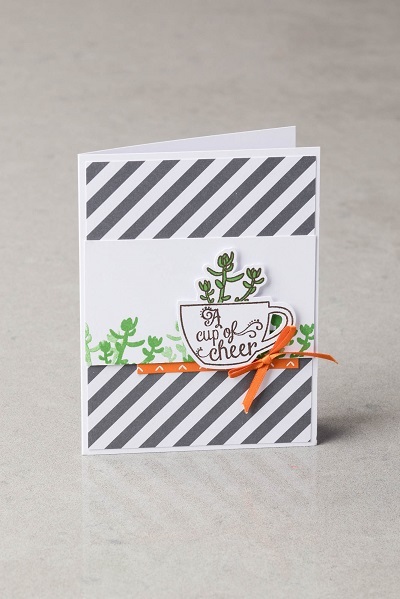 The stamped succulent makes a nice background for the teacup on the larger card. 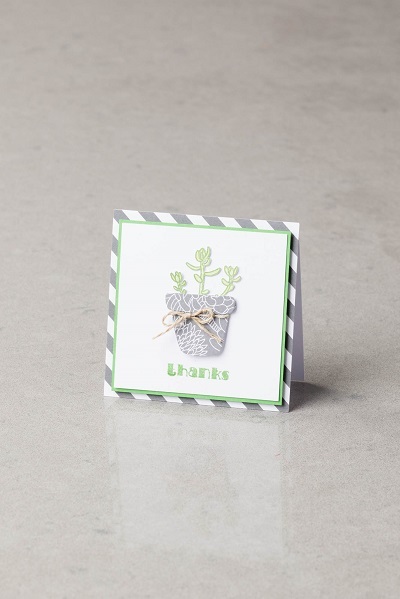 And the layer of Cucumber Crush Cardstock adds a little pop of color on the smaller card. Get creative with the paper that comes with the kit to cut out a pot for the plant. And if you’re extra patient, fussy cut around the plant outline. 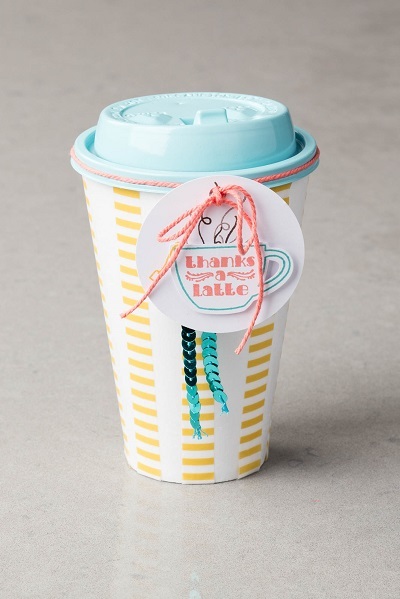 While it might be a little tricky to deliver a hot latte to a friend, why not deliver some treats in a foam cup? Stamp a quick tag and add some Calypso Coral Thick Baker’s Twine (138412), Bermuda Bay Sequin Trim (137910), and 2014–2016 In Color Designer Washi Tape (138382) to finish it off. Don’t be sad when your cup is empty or when your kit runs out, just order a refill. Enjoy! I love your work Tami. Thanks for sharing. Thanks so much for writing Debra! This means a lot. I love your creation for this kit. I enjoy different ideas using paper pumpkin kits and this is really fun.